Industrial Light & Magic walked a fine line between reality and fantasy with director Ryan Coogler on Marvel's cultural phenomenon. In order to bring Wakanda to life for “Black Panther,” Industrial Light & Magic’s visual effects supervisor, Craig Hammack, took a deep dive into African aesthetics and architecture. The result was a notable one for the zeitgeist-grabbing Marvel blockbuster, which pays homage to the diverse beauty of Africa’s past and present. 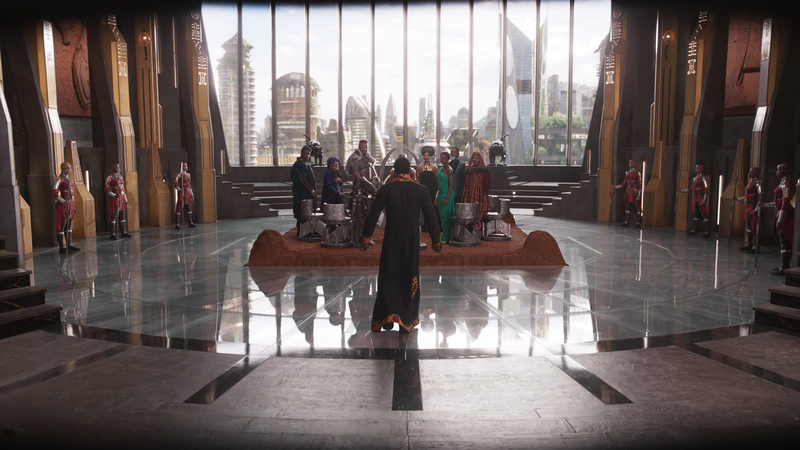 They started with the 500-page Wakanda bible by production designer Hannah Beachler, which provided every macro and micro detail imaginable about the fictional civilization. 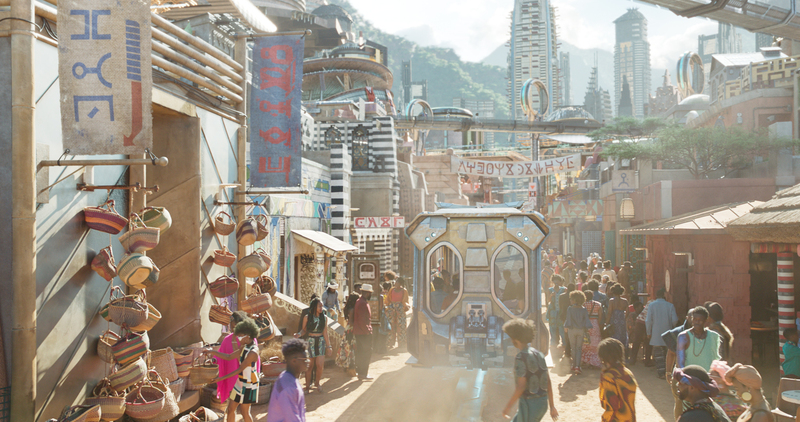 “It allowed us to absorb the culture of the individual tribes and translate that into the urban design of the whole city so that everyone gets their distinct districts,” said Hammack (“Tomorrowland”). And by understanding the tribes, you understand the needs of the architecture. Wakanda spans six miles in length and three miles in width, with 60,000 buildings surrounded by 12 million trees. ILM’s environment team modeled hero buildings in Maya. The buildings got taken apart and used as kits to assemble unique structures. ILM then used a scatter system to place a library of smaller buildings throughout the city. 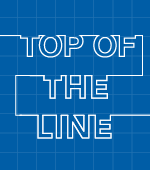 “At that point, we could divide districts among individual artists to do urban planning, city streets that funnel into alleyways and large pathways,” said Hammack. The most attention to detail by ILM was given to Steptown, the hipster cultural center and the epitome of Afrofuturism. It’s dry and dusty and yet urban with lush elements around it. “It’s an interesting mixture of ideas,” Hammack said. “There are dirt streets but 1,000-foot high rise buildings. “Materials and building structure ideas harken back to traditional African aesthetics. There’s red dirt in a lot of Uganda streets and the lower structures of the buildings that we built almost flow into Mesopotamian structures. But they are all things that you find in Africa, even now in modern architectural design. 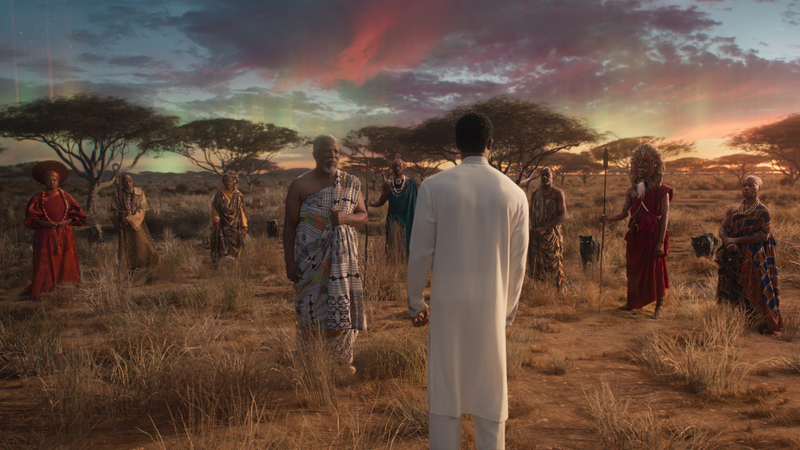 ILM also modeled environments for the two Panther dreams when King T’Challa (Chadwick Boseman) visits his father T’Chaka (John Kani) in the spirit world. It’s a surreal look comprised of floating islands yet grounded in real African geography of a savanna plain. “It’s flat and reaches out to the horizon with flowing acasia trees and long grass,” said Hammack. In the trees are CG black panthers from ILM, representing the spirits of Wakanda kings. One of them jumps down from a tree and transforms into T’Chaka. The first nighttime dream features multi-colored aurora borealis and deep saturation with bright stars. The next one contains warm, golden sunlight. The stylized lighting was a collaboration between VFX and Oscar-nominated cinematographer Rachel Morrison (“Mudbound”).